Thank you, thank you everyone who made it to Bettona this year. 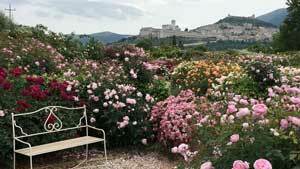 It was aWeekinUmbria’s best yet welcoming over 50 people on various tours . 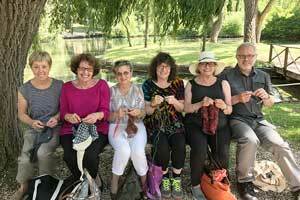 . .
• The season began with our wonderful Knitting and Fiber adventure in May. 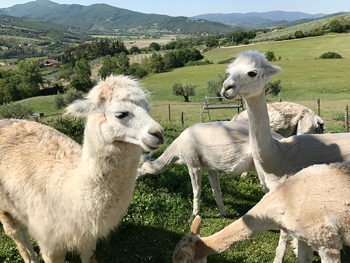 We explored an alpaca farm in Umbertide and then set out for Chianti to a cashmere goat farm where we got to comb a few goats and feed a few babies. 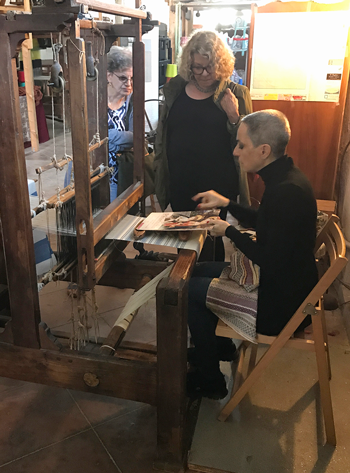 Factory visits to see modern weaving and knitting production were fascinating. But probably the highlight of the tour was meeting Marta Cucchia of Laboratorio Brozzetti in Perugia. Marta is a phenomenal talent and her recreations of Renaissance designs woven on antique Jacquard looms are over the top gorgeous. 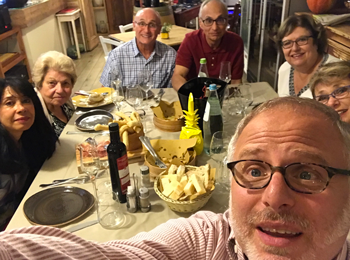 • Two Culinary and Wine tours with cooking lessons by Maria Luisa Scolastra of Villa Roncalli in Foligno, wine tastings at Cantina Dionigi in Bevagna and Paolo Bea in Montefalco, great meals out at Rocca Fiori, il Rientro, Herba Luna, Oscars, i Birbi, and my favorite Roman-style pizza in Bevagna. 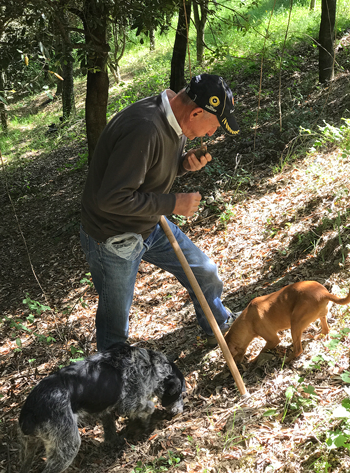 Ahh, the food in Umbria is fantastic! 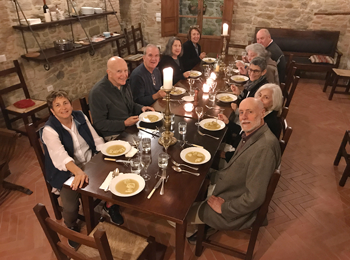 • Three family groups came to hang out and explore Umbria — what great barbeques we had in the orto and it was certainly worth the climb to Civita di Bagnoregio for a those lunches at Alma Civita. Thanks for returning a third time Howard and Jodi and bringing the whole family. Next time with the grandkids. 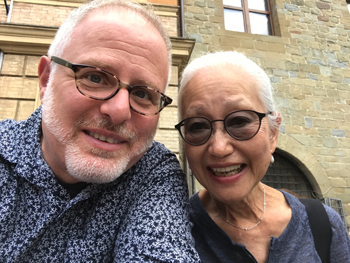 • A personal highlight, and a reunion with old school friends — was getting to spend time with Jackie Jenkins and family and to reconnect with my best friend from Junior High, Ken Bè. Thank you for the spectacular lute concert at the palazzo. Great to to know that even after more than 40 years we can still pick up our friendship. 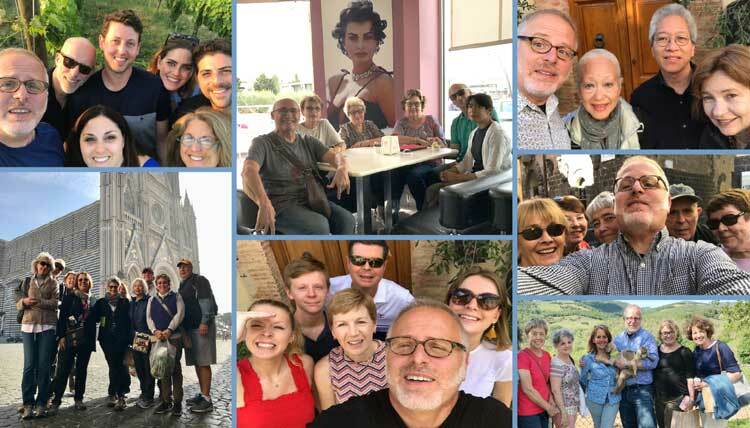 • What a great time our Italian group had on our Parliamo in Italia tour. With the help of a Jane Bertolino, and lots of pushing, the entire group saw a big improvement in 10 days. Well, at least they got their questions out there faster. Such nice people and a wonderful adventure with memorable experiences for all. I’ll never forget everyone ordering cheese at Orvieto’s weekly market. 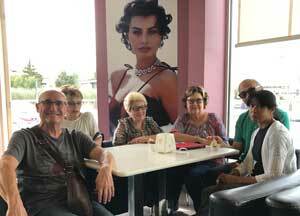 • Three groups came to visit as a result of charity auctions for two local arts organizations in New York and the House of Good Shepherd Domestic Violence Shelter in Chicago. 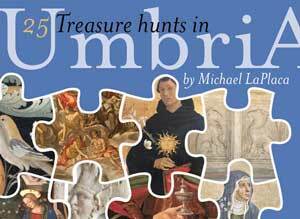 So glad aWeekinUmbria could help raise money for you. Really nice people too. 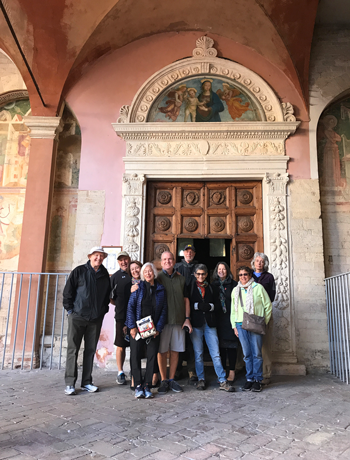 • And the season came to a wonderful conclusion with a small group tour with a great group of lawyers and friends from Saint Louis. Such a nice group of people and so many laughs. Join Shaina Bilow on this 8-day knitting and fiber adventure. 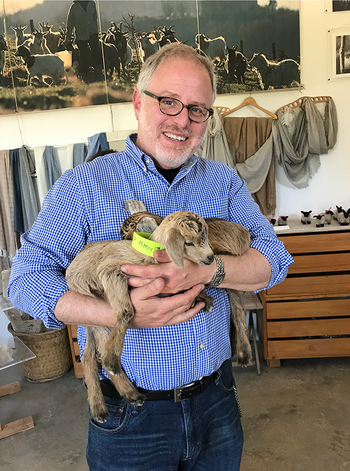 Visit cashmere and alpaca farms, a jacquard weaving studio, and commercial processing, knitting, and weaving factories.